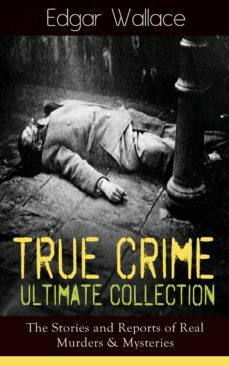 This carefully crafted ebook: "True Crime Ultimate Collection: The Stories of Real Murders & Mysteries" is formatted for your eReader with a functional and detailed table of contents. Edgar Wallace (1875-1932) was an English writer. As well as journalism, Wallace wrote screen plays, poetry, historical non-fiction, 18 stage plays, 957 short stories and over 170 novels, 12 in 1929 alone. More than 160 films have been made of Wallaces work. Table of Contents:	The Secret of the Moat Farm (1924)	The Murder on Yarmouth Sands (1924) The Great Bank of England Frauds (1924) The Trial of the Seddons (1924) Herbert Armstrong - Poisoner (1924) The Suburban Lothario (1928) Excerpt: "There is no more dangerous criminal than a small larcenist who has escaped the consequence of his offences, through, as he believes, his own dexterity and skill. Having this good opinion of himself, he progresses from crime to crime, until there comes a moment when he finds no other escape from the consequences of his meanness and folly than the destruction of a human life which, as he believes, stands between himself and freedom. And so confident is he in his own genius for evasion that he will plan the most diabolical of crimes, perfectly satisfied in his mind that the success which has attended the commission of minor offences will not desert his efforts to evade the penalty of his supreme villainy."